Not long after the U.S. Federal Reserve indicated in the spring that it might start unwinding its bond-buying program by the end of this year, gold fell more quickly than it had in three decades. Now that the Fed really has done the deed, the precious metal is holding up pretty well. After the Fed announced overnight that it would reduce its monthly purchases by $10 billion a month, spot gold fell 2.3% within two hours, but four hours after that, it was within half a percentage point of its previous close. By early afternoon on Thursday in Asia, spot gold was at $1,220.10 a troy ounce, up 0.1% so far in the day and down 0.9% compared with Tuesday’s close. Back in April, gold investors were in part concerned about U.S. bond yields rising, which could diminish gold’s safe-haven appeal and push the dollar higher, which also tends to hurt prices of dollar-denominated commodities, as it makes them more expensive for holders of other currencies. A Shanghai-based gold trader said it isn’t so surprising that the precious metal’s price has been relatively steady in the face of the Fed’s move. “After all… the macroeconomic background for gold hasn’t really changed that much” given that the U.S. central bank is only diminishing—not cutting off—its bond-buying program. Even the initial dip was more pronounced than it might have been if the timing of decision hadn’t been well-flagged: The price was bid up in the hours ahead of the announcement as investors scurried to close out short positions, bets that prices would fall, in case the Fed would have decided to stand pat on its stimulus. Meanwhile, gold has had strong support at the $1,200 level. Spot gold has only breached that level once this year, hitting $1,180.20/oz during intraday trading on June 28. “I think longs are trying to protect [gold’s price] at $1,150-$1,200, as that’s where gold miners break even this year,” the trader said, referring to investors who set up “long” positions—bets that the price will increase. Traders said that such investors helped support gold prices after the initial dip following the Fed announcement. Seasonal buying in Asian countries, including China, will also provide a floor for prices. Chinese typically buy gold bars or jewelry as gifts to mark the Lunar New Year period, which this year straddles January and February. 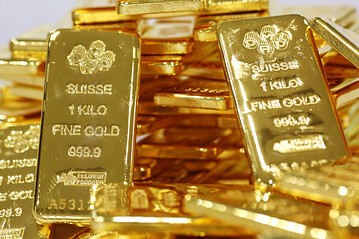 Intl FCStone senior analyst Ed Meir said the next few days will be decisive for gold. If it resumes a downward course, it may “retest of the old lows of around $1180/ounce,” he said. How currencies, especially the dollar, react to the news will be particularly influential on gold’s direction. “I think we want to see what Europe and the U.S. counterparts will do later” Thursday, the trader said, . So far, the dollar is higher against its major rivals, with the U.S. Dollar Index, a gauge of the greenback against a basket of global currencies, up 0.6% at 80.755. “We think the reaction in the markets is far from over, and we will likely need to get through this week before the bulk of the volatility subsides,” Mr. Meir said.